Editors: Janoski, Thomas, Alford, Robert R. and Hicks, Alexander M., et.al. 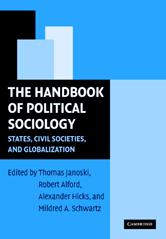 This handbook provides the first complete survey of the vibrant field of political sociology. Part I explores the theories of political sociology. Part II focuses on formation, transitions, and regime structure of the state. Part III takes up various aspects of the state that respond to pressures from civil society.